I’ve finally decided to register and post, after poking around here for quite some time. I’ve appreciated all of the info and tips on here, but never actually felt an extreme need to ask questions myself. Regardless, I’ve now hit a mental block with where to go next, and I’m hoping by introducing myself and getting some opinions from you all, it will help me decide! A little about myself. 38 years old, from Akron, OH. I’m a former Marine (98 – 04), and a father of a 12 year old girl. I’m a gearhead (hence “USMC” and “Stang”, guess what kind of car I have, lol), and a very amateur woodworker at this point. Most of what I have made to this point has been either shop furniture, outdoor projects, or very basic construction. I use a lot of 2×4s, for lack of a better description, and it took me a long time to even be interested in what “6/4” or “board feet” even meant. (I know now, but it pains me to see how much something that literally grows on trees can cost). 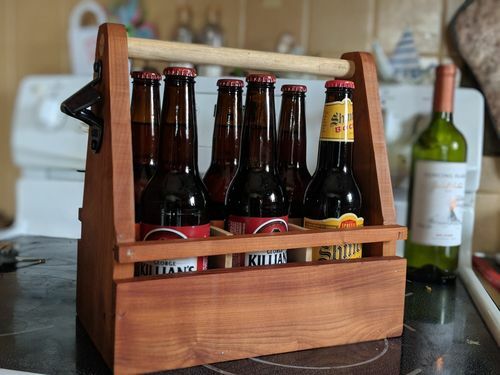 It’s simple…just a beer caddy, but it’s made out of something other than just stock pine from Home Depot (cherry and poplar, in this case). I’m mighty proud of it, for being the first “nicer” project I’d even attempted. This brings me to where I am now. I want to expand and learn, but it is very easy to fall into the “tool collecting” trap, and not actually MAKE things. So, I have a budget of $1000 for “tools” right now, and I’m thinking about what to go with next. A $20 Black and Decker 7” band saw from the 80s I picked up at a flea market to mess around with…it’s poorly made, underpowered, and all around “junky” feeling, but it will cut things. I’m working out of a non-heated, unfinished, 3 car garage. 2 of 3 bays are occupied almost nightly. I built a 4’x7.5’ rolling workbench last year that has served me well for assembly, outfeed, and just about anything else I have ever asked of it. It’s a monster of a thing, but it will easily support an engine block without ever even flexing (ask me how I know). So, sorry for the ongoing wall-of-text, but with my budget, I’m looking to make a decision on a tool (or two, or three), buy it, and MAKE something…I don’t care or know what to make yet, just that I want to stop using the “oh, I need this tool” excuse. If I could do all of that for under $1000, it’d be a no-brainer…I’d just do it all, but it seems unlikely. I’m fine with searching Craigslist, Ebay, and LetGo, but there just hasn’t been much as of late worth looking into (the table saw was a LetGo find, BTW…$150 and had a new DeWalt blade on it). One thing to keep in mind is that I get a 10% discount on everything at Lowe’s, and there are two Harbor Freight stores within 15 minutes of me. I survived on HF tools for years, so I won’t totally rule them out, but I can afford a bit better quality at this stage. It sounds to me like getting woods (that are better than construction grade) is one of your biggest hurdles. I would surmise that part of the reason is cost. I would imagine that part of the reason for that is that you have priced lumber that is S4S? So, I think I would advise buying tools that allow you to use cheaper lumber. That could mean raw but kiln-dried stock from a lumber yard. Or, a little cheaper, air-dried stock from local sawyers or craigslist ads. Or, going deeper down the rabbit hole, finding trees laying on the ground and making your own stock. Going down this path, I would recommend a thickness planer first. You can then either buy a jointer, use hand planes to flatten and square the first 2 faces or make a jointing sled for the planer and a first-side-rip sled for the table saw. Going a bit deeper and considering trees you find or get from CL ads, I would add a bandsaw that is big enough to handle re-sawing and make a sled to saw small/medium sized logs into slabs. If you have ample opportunity to get your hands on larger trees, throw a chainsaw mill into mix to break down big trees where they fall. There’s really at least 100 possible answers to your query so I hope this is at least a little bit helpful! Get a top notch table saw. Even a quality contractor’s saw with full cast iron tables will good a great job. Next…..a good bandsaw. I have a Grizz 14” that has served me quite well for the money and space it requires. WELCOME ABOARD MARINE. Remember that there is no such thing as a “former” Marine. You ARE a Marine. There s really at least 100 possible answers to your query so I hope this is at least a little bit helpful! Get a top notch table saw. Even a quality contractor s saw with full cast iron tables will good a great job. HokieKen, you’re definitely spot on…the wood itself that I’m looking at is almost always S4S, simply because my bandsaw has a resaw capacity of…well…nothing, and my table saw is rather small. I have no thickness planer or jointer, other than a small power hand planer and a few traditional block/ jack planes. Bill White, in a similar vein, I just recently bought the DeWalt table saw after struggling for years with a POS harbor freight deathtrap. To me, the DeWalt IS top notch by comparison, even for just the rip fence alone, though I realize it’s a jobsite saw and leaves a lot to be desired when compared to the big boys. That said, I could probably turn around and sell it for what I bought it for, adding $150 to my $1000 budget. I’m liking both of your thoughts on this so far. I didn’t even think of the improvement to my raw material costs that could be had with investment into the right tools. I won’t be able to get a brand new SawStop or monster Laguna bandsaw, but if I’m not spending so much on wood, I can save up for later! A thickness planer (DeWalt 735 kind of rules the roost as far as bang for buck) and a 14” bandsaw with a riser block can both be had under your budget. Especially if you watch for a used bandsaw. Those two combined will go a long way for breaking down stock. FWIW, looking at 4/4 stock, if I buy S4S kd stock, it’s $9/bf. If I buy raw kd stock, it’s about $7/bf. If I go with air dried stock, I can usually find it for less than $4/bf. You can do the math from there on how long it would take to justify the cost of being able to mill your own stock from rough sawn boards vs paying someone else to do it. Also, I would agree that you will likely outgrow your table saw pretty quickly. BUT, that depends on what kinds of projects you do. If you do smaller projects, you may find that you rely more on a bandsaw than on a table saw. I would keep what you have if it gets the job done to your satisfaction. Then upgrade when it doesn’t. I agree with Bill on the bandsaw too. I have a 14” Grizzly with a riser block and it’s a workhorse. My most shop altering tools was the jointer. Flat and square is damn important in woodworking. If you play your cards right id be willing to bet you could go out and get yourself a jointer, planer and tablesaw for $1000 on craigslist if youre patient enough. A 6” jointer, a lunchbox planer and a hybrid tablesaw is what im thinking. What part of the country are you in? Im sure there’s enough CL junkies around here that wouldnt mind looking around for you. Edit – nevermind … akron Ohio. I should read betterer. I’d go better tablesaw, good planer, better bandsaw. I’d also suggest researching what you want then put your old tool up for sale, sale it then put that money toward your new one. If your patient enough you can always make and sell a few projects to help expand your budget. A really good way to find out what you need is to start listing your next projects and then figure out what tools you need for it. i think the answers the guys have given so far will get you going but beyond that figure out what you want to build and buy as needed rather than getting tools you probably wouldn’t need.nice beer caddy and welcome to lumber jocks and thanks for your service. Well you guys are just awesome! This is really the perspective I was looking for, and I think, for the most part, being able to process lumber from rough sawn, thus saving money on raw materials is really going to open things up. Thus far, some of the projects I’ve had in mind are basic cabinetry in the house, shelves, small caddies for things like mail or keys, etc. Basically, taking things that I’ve built all over my garage and outside, and making better, more finished examples. I will say this…so far, I’m happy with the DeWalt TS, simply because of the fact that it’s such an upgrade over what I’ve used for over 15 years. I know I’ll outgrow it someday, and it doesn’t have dado capability, but I use my router for dadoes/ rabbets anyway. That’s a new one, and would run me about $400. Chrisstef, the CL link you posted looks like it might have some promise! Squaring and surfacing the lumber comes next. I’ve been coveting a DeWalt 735 with the outfeed tables and DeWalt cart/ stand for $650 (the stand is free, and usually costs $200) at the local woodcraft store. Any major drawback to picking up a Rigid or DeWalt 734 though, for a beginner like me? It would be close to half the price. I’ve seen jointers on CL and LetGo from time to time, but there seems to be a large price break between a little 4” jointer, and a 6” or larger. By the way…I AM a junkie for older, quality tools, and in no way feel the need to buy new, but at the same time, I don’t want my major project to be restoring an old bandsaw for over a year just to get it operational and accurate. Some heavy rust or needing new blades/ guides is one thing…rebuilding it from scratch is another story, as I won’t know the true cost until it’s successfully cut some wood, ya know? I’ve got the machining and fabrication abilities (my father was a tool and die maker, and taught me a lot through the years…he still has tons of tools and equipment…but they’re more for metalworking), just not the time or inclination, lol. Y’all have been a big help so far! Buy a big tarp if you get the 735. Ive gotten by with a cheaper delta planer for a long time. However i do covet a bigger one vaguely 10 years into the hobby. Id bet it would be a while until you needed an upgrade. Just an idea if you had to trim up $ on an item. Pick a new project, choose what new tool you need, and buy it. Hell, buy a couple tools. Gotta have “this”, to do “this”, to that thing you wanted honey. Enjoy the trip. Its an endless rabbit hole for as deep as you wanna dig. All good advice above. I would offer a word or two of caution about using pallet wood. It is a tempting source, but it is usually loaded with dirt, grit, and maybe unfound nails, etc. I would never run it through my planer without a good pressure washing and presanding with a coarse belt sander. Even then, only with caution. Also, some pallets are used with various chemicals that penetrate the wood. I wouldn’t use those at all. Speaking of planers, HokieKen mentioned the Dewalt 735 as being good. I have had the 734 for years (lunchbox style) and it has been great. It is about 20%-25% cheaper than the 735 and can be found on the used market from time to time. I actually have a Delta planer too. And like chrisstef said, it gets the job done fine. As do the 734 and many other lunchbox planers. If I were buying a planer today, I’d go with the 735 without a doubt. The 4 posts and the automatic cutterhead lock are worth the premium IMHO. Also, guys score that planer in the $400-500 range often on this site. Watch the Hot Deals thread and you’ll find out when there’s a deal on it somewhere.